The Custom 845 is Pilot’s top of the line fountain pen (limited editions and Namiki branded pens not included). The 845 retails for an eye-watering 500,000 YEN (approximately $495 USD) and has received some mixed reviews. People have questioned whether it should command a price near an entry-level Nakaya. You get Pilot’s largest (Pilot branded) #15 nib in two tone 18kt gold with a large “gem” carved ebonite body and urushi lacquer finish. You also get a black painted Con-70 converter and an upgraded box. While in Japan I was able to play with a number of Pilot/Namiki pens and I ended up loving the Custom 845. Now that I have had a few weeks to put it through its paces let’s see how it stacks up. The Custom 845 is a classic looking executive pen with a black body and yellow gold furniture. The cap has a flat top with a clip that starts broad and narrows ending with a ball. 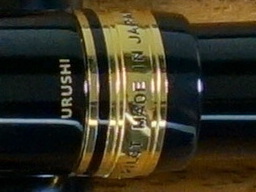 The gold band at the bottom of the cap reads “* * * CUSTOM 845 * * * PILOT MADE IN JAPAN”. The letters are filled in with black (paint?) so they look nice and crisp. The back of the cap has “URUSHI” in gold letters. The large two-tone #15 nib looks great and features some nice scrollwork on the silver center. I really like that Pilot puts a date stamp on these nibs. The left bottom corner of the nib is stamped “813” which translates to August 2013. It’s hard to look at a pen like this and not think about Montblanc. The 845 with its flat top clearly isn’t a Meisterstück but it clearly is a Japanese take on a German style pen and that is definitely not a bad thing. Many people, including myself, rave about Pilot’s build quality. I hadn’t spent much time with the Custom line before these last three weeks and while I still maintain that Pilot builds exceptional quality pens I do have some issues with the Custom 845 and the Custom 743 (review to come later). To start let’s talk about the body of the 845. Above I said this pen has a lacquered ebonite body and it does….mostly, except for the section, the end of the body and the ends of the cap, which are plastic, or “resin” if that sounds more appetizing. Custom 743 with Custom 845. Both have the same plastic section. The plastic parts are not painted with urushi lacquer but nonetheless they do blend together well. The section has two visible seams and this to me is just wrong on a $500 pen. To be fair these “issues” aren’t actual build quality problems but more an indication that this pen was built to a price. If you could build this pen without plastic and paint the entire pen in lacquer why wouldn’t you? Other than the seams the fit and finish are flawless. The pen is sturdy and does not have the delicate feeling that a Nakaya has. 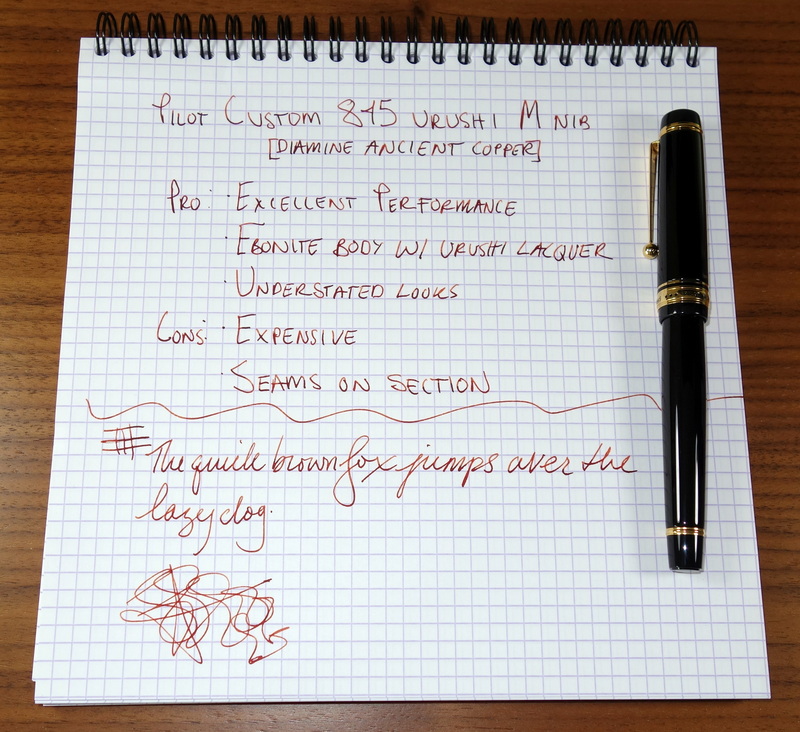 With the 845, Pilot took a very practical design and really brought it to the next level by adding multiple coats of urushi lacquer. It is a wonderful pen to touch. 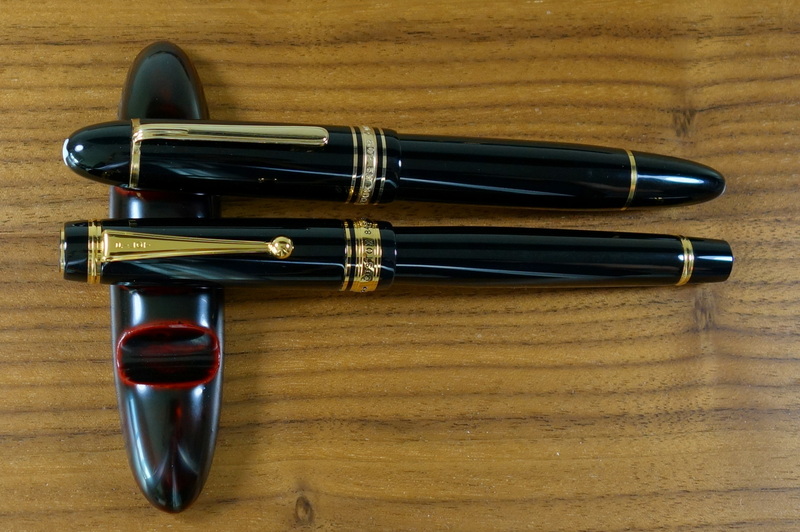 I compared the 845 to my Montblanc 149 and based on superficial fit and finish alone the Montblanc wins. The engraving on the ring of the 149 to me looks nicer and the Montblanc has no seams on its body despite being made entirely out of plastic. I suspect that in the long-term the Pilot will hold up better than a 149 as the lacquer is much more scratch resistant than plastic and I have seen real problems with Montblanc quality. I have had plating issues with Montblancs as well as nib issues on brand new Montblanc pens; both things I have yet to see with any Pilot. The Custom 845 measures 5.7” capped and about 5.2” uncapped. At its widest point it is about 0.6” and weighs about 28.8 grams. The 845 is a good sized pen similar in girth to a 146 but closer to the 149 in length. The 845 posts well and does have a good balance posted but for long writing sessions I prefer the 845 unposted. I believe most people would find the 845 to be a comfortable pen. I sampled the fine, medium and broad nibs and found that the medium to be my favorite. Being Japanese, the medium is closer to a western fine. The Pilot-made # 15 18kt gold nib writes beautifully. I haven’t had any issues with skipping, hard starting or poor flow. The nib is somewhat soft for a standard nib and it is ultra smooth and responsive. It writes like a $500 pen should. The feel is phenomenal; in fact I believe it’s the best writing stock round tipped nib I have come across on a modern pen. The Custom 845 uses Pilot’s famous Con-70 converter which is considered by many to be the best converter money can buy; despite this, the 845’s cartridge/converter filling system tends to receive some criticism as many people feel that the $200 cheaper Custom 823 offers more value with it’s vacuum filling system. It is true that the vacuum filing system holds more ink and it is likely a more expensive mechanism but as a cartridge/converter lover the black Con-70 is pretty much perfect. The Con-70 holds more ink than most converters and has a unique push button mechanism that you push four times to fill. The problem here is what do you compare the 845 to? At $550 a Nakaya is a great value and I know that because there are a lot of similar pens to compare it to. 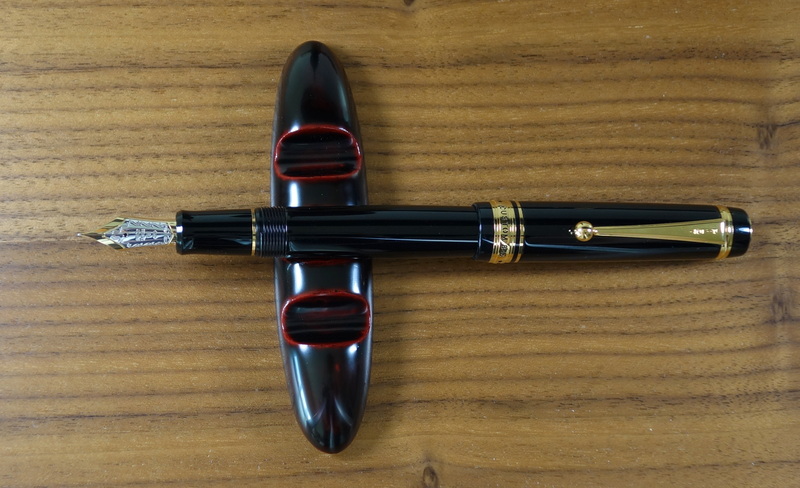 The 845 is different, it’s more usable, it’s more solid feeling than a Nakaya, to me it’s an urushi Montblanc sans the status and for someone who wants that there aren’t many alternatives in this price range. I think $495 is about right for this pen. 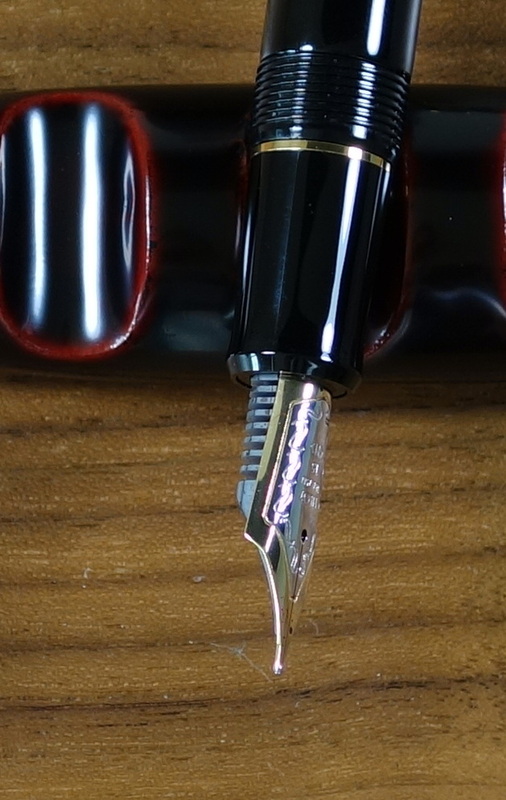 You will be hard pressed to find another high quality urushi fountain pen for less money and while it’s hard to call the 845 a steal it’s also hard to call it overpriced. My ratings for this pen have been pretty harsh but I would like to mention that when I bought this pen I tired a TON of pens at the store including much more expensive Namiki pens with #20 and #50 nibs as well as a number of Sailors and Platinum pens. I liked the feel of the 845’s nib the best and I think I would pick the 845 again given the chance. 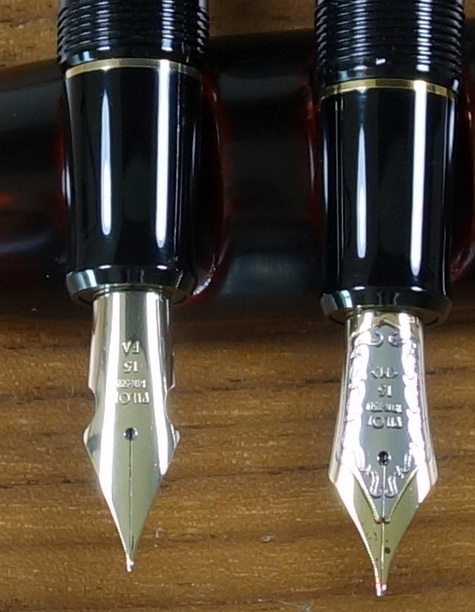 If a Montblanc and a Nakaya had a baby it would be the Pilot Custom 845. Does it fits on your nakaya desk pen stand? Yes, the 845 does work well with my Nakaya desk pen stand. Most modern full-sized pens work in the stand. Skinny pens and overly fat pens (like a Montblanc 149) are not compatible. The price of the Custom 845 in Japan is JPY 50,000. You added an additional and unsettling zero. The conversion to dollars is correct.